Adventure center Nomad 2000 offers you a tandem paragliding in Slovenia in Bohinj and Krvavec area. In Bohinj you can join us on three different locations – starting point from Vogel, Vogar or Studor. For those who think that the way to Bohinj is too long you can choose Krvavec, a well known skiing resorts on the slopes of Kamniške Alpe – around 35 km from Ljubljana. On your request you can fly with us also from other locations in Slovenia, that can be arranged from our side. 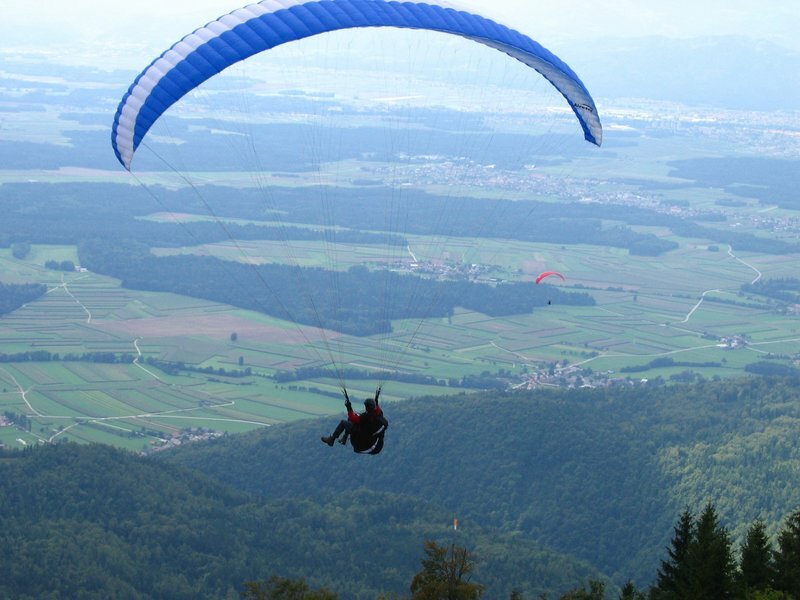 Tandem paragliding in Slovenia is performed under the guidance of experienced instructors of paragliding. You don't need previous experiences. Besides sport clothes you will need for tandem paragliding also good climbing boots and a lot of will. Before you start with tandem paragliding you will be informed what to do while taking off - landing. On your request we can organize additional transfers on the locations, guided sightseeing, lunch or dinner. At the end of your adventure and on your request we can arrange for you a nice picnic. If you are planning to stay with us several days, we will be more than happy to help you with accommodation. Paragliding Slovenia - Bohinj – Studor is considered as a shorter glide but an attractive panorama of lake Bohinj has a special charm. Studor is situated on the north side of lake Bohinj. A difference in altitude from taking off and landing point is 500 m. It takes around 10 minutes. We are landing beside lake Bohinj. Paragliding tandem Slovenia - Bohinj - Vogel is considered as the most beautiful glide in Slovenia, with the view on Julian Alps and its highest peak Triglav (2864 m). A difference in altitude from taking off and landing point is about 1200 m. It takes around 20 minutes. A chair lift will take us to the starting point. 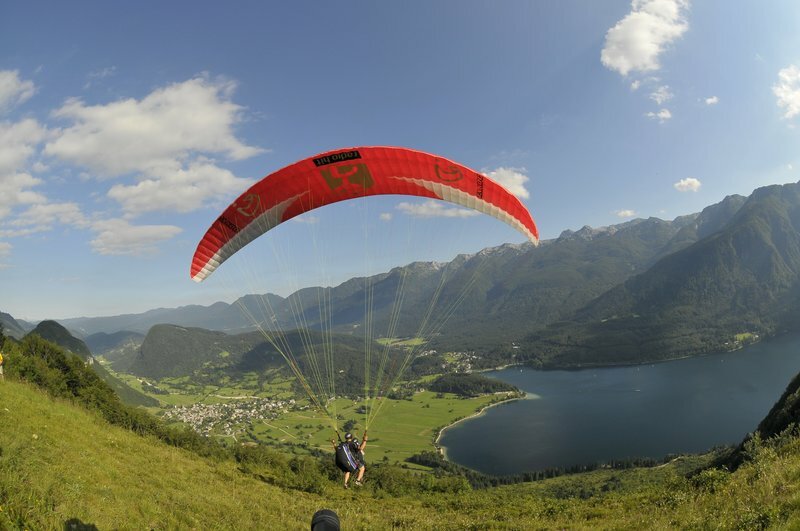 Paragliding Slovenia - Bohinj – Vogar is considered as a shorter glide with an attractive panorama on lake Bohinj. Vogar is situated on the north side of lake Bohinj. A difference in altitude from taking off and landing point is 500 m. It takes around 10 minutes. 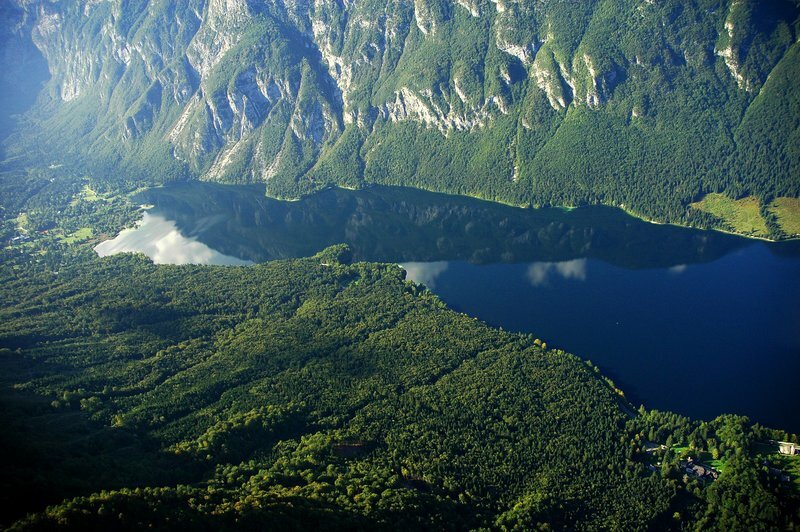 We are landing beside lake Bohinj. Paragliding in Slovenia - Ambrož under the Krvavec has an easy approach and beautiful panoramic view will make paragliding from Ambrož impressive. A difference in altitude from taking off and landing point is about 800 m. It takes around 15 minutes. We are landing in a village called Grad.